William F. McIntosh's most notable contribution to percussion was an early snare throw-off design for which he received a patent on February 9th, 1909. 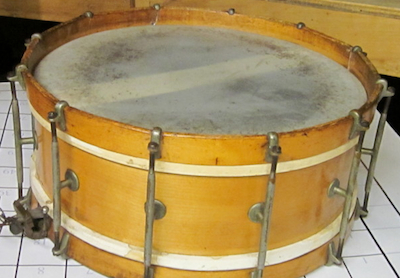 Over the next two decades, his so called "Snare Strainer and Muffler for Drums" would be installed on hundreds if not thousands of snare drums including many by Boston's George B. Stone & Son. According to Christine Merrick Ayars' Contributions to the Art of Music in America by the Music Industries of Boston 1640 - 1936 (New York: H.W. Wilson, 1937), McIntosh had by the 1930s taken up other interests and was dealer in radios and radio equipment. As discussed in a previous post about a William F. McIntosh rope drum, McIntosh had only a very small industry presence as a drum builder and it is unclear exactly to what degree he was capable of manufacturing for himself the various components needed to produce drums. He did however assemble a small number of snare drums over his life span, three of which are featured here. First comes a pair of drums now in the possession of the Italian American Citizens Club in Malden, Massachusetts stamped "Wm McIntosh Drum Maker Charlestown, Ma" inside the shells. 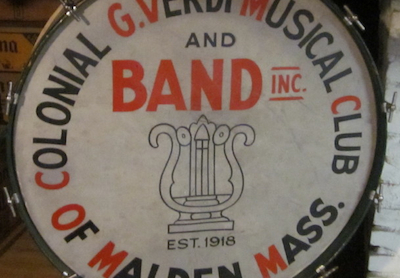 The drums were apparently owned by the Colonial G. Verdi Musical Club of Malden and reportedly were used for the annual Saint Rocco Processions for many years before being stored away in a basement. No other information or photographs were provided but it is interesting to note that the snare drum employs twelve Stromberg-like separate tension lugs and McIntosh's patented strainer and muffler. 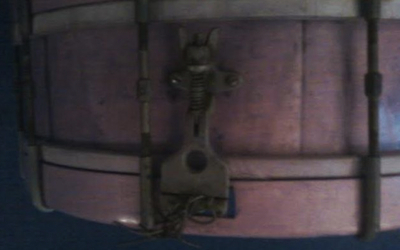 Also noteworthy are the collar hooks similar to those used by Stone & Son on their Separate Tension Drums. 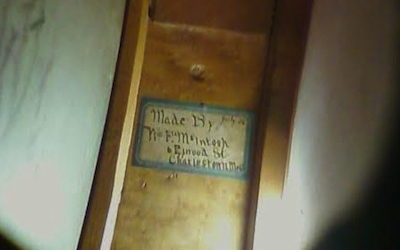 Secondly, a reader sends along a few (rough) photographs of an early McIntosh orchestra drum with a handwritten label reading "July 03, Made by William F. McIntosh, 6 Elwood Street, Charlestown / Mass." The snare strainer present on the drum is a patented Stromberg design and is stamped 'patent pending'. This would suggest that the strainer was produced after the patent was applied for, but before the patent was granted on April 5th, 1904. This corroborates the date of July 1903 date written on the makers label. Do you have a drum by William F. McIntosh? I would love to hear about it! Feel free to send Lee and email anytime at lee@vinson.net.